I’ve gone grain crazy as of lately. There are so many different types of them to explore. It started with a pack of bulgur, coarse grinds of whole wheat with a muddy tan color and toothsome, chewy texture. If you like wild rice, you’ll find some similarities here. Then I went freaky for smoky roasted spelt, also known as freekeh. Now I can’t get Missy Elliot out of my head. They’re not as freaky as they sound, though, these uncommon grains. People have been eating them for longer than potatoes; they are some of the most rustic food staples around. Most of the time, we tend to refine our grains into powdery flour, extracting the bran and germ from them, along with most of their nutritional content (which is often added back later to “enrich” the flour). The ironic thing is that, after all that work, bleached, enriched, refined all-purpose flour is cheaper today than the whole grains that are much coarser — especially noting the word “refined.” Oh well! You can help change that by eating more of the latter. And all the better to your health for it. But how do you cook them? Here’s one way. You certainly don’t need to make this pilaf with both bulgur and freekeh; likewise, you can make it with any whole grain. Barley, farro, spelt, quinoa, oats, wild or brown rice, choose your own adventure. A combination of more than one types of these grains make a pilaf a little more interesting, for a little contrast of taste and texture. 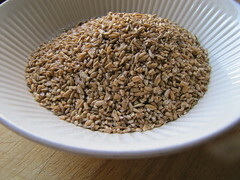 Note that bulgur and freekeh are wheat (or in the case of this freekeh, made from spelt which is very similar to wheat) products and are therefore not gluten-free. Start by cooking your dry grains, both the freekeh and bulgur, in separate pots as they’ll have different cooking needs. I found that a cup of bulgur to two cups of water, simmered covered about 20 minutes or until all soaked up, cooked it just perfectly. For the freekeh, which are larger grains, a cup of that to three cups of water worked out the same way. Let these cool uncovered a while; also, stir them up a lot as you do so that it gets to air out and separate. Now they’re just chewy and dry enough to coat with olive oil and combine with other ingredients in a pilaf. Since it’s winter, I went with roasted squash as the main addition to this one. Sweet and mild-tasting, it doesn’t compete too much with the subtle, nutty flavors of the grains. 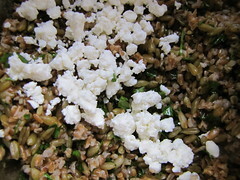 Then, because it is so flavorful — salty and briny — I added crumbled bits of feta to this dish. It’s a natural choice for serving in salads and scattered dishes like this pilaf, since it crumbles so easily. It also gave it some Mediterranean flair to complement these grains, which are commonly eaten in the region. 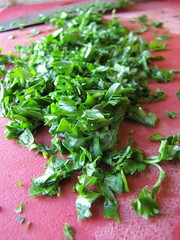 Some chopped parsley and lemon juice came next, and what isn’t better with a sprinkle of them? Sweet, savory, earthy and fresh-tasting this pilaf was, all combined. It’s not the kind of dish that’ll blow a circuit in your tastebuds, but it’s pleasantly light and healthy, just the perfect kind of thing to dig into every day. I’d eat it every day, make one big batch over the weekend, although it doesn’t take very long to cook from scratch right away. It even makes an easy party-pleaser, as tried and tested on guests at a small potluck I threw, on a rather lazy Sunday when I admittedly didn’t feel up to cooking elaborately. What better food to serve people you care about than the healthiest, anyway? So long as you make enough, no one goes home hungry, and you’ll have leftovers you won’t feel bad about polishing off. Incidentally, no one knew what they were eating, the grains at least, and the word “freekeh” was not to be uttered without some confusion and spelling checks throughout the night. It was my first introduction to the stuff, too. (The attendant at Cayuga Organics’ Grand Army Plaza Greenmarket told me all about it and even provided recipe cards for it at their stand.) I’m looking forward to cooking it next into a soupy, risotto-like dish, maybe, or just swapping it in for rice and now and then, as I’ve already been doing with that bulgur. Cover the bulgur with 2 cups of water and place on medium-low in a saucepan. Reduce heat to low when it begins to bubble, and cook for about 20-30 minutes, until water is all soaked up. At the same time, do the same for the freekeh and 3 cups of water. Once cooked, fluff grains with a fork and let cool, uncovered, for 30 minutes. Preheat oven to 400 degrees. 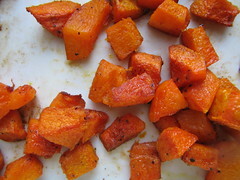 Toss the squash pieces in about 1 tablespoon of the olive oil and a couple pinches of salt and pepper, and the optional cayenne pepper. Roast for about 10 minutes; flip and toss once with a spatula and roast for another 10-15 minutes (depending on how large your chunks are) until pieces are just golden and crisp on the outside. Let cool completely, about 10 minutes. In a large bowl, toss the grains with the remaining olive oil and lemon juice and season with generous dashes of salt and pepper. Add the crumbled feta, squash and parsley. 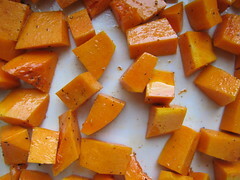 Serve immediately to retain crispness of the squash pieces; mixture can also be made up to a couple days in advance. Three brownie points: Tremendous. 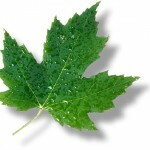 You don’t often see such a variety of vitamins and nutrients squashed together in so few ingredients, as you do here. With Vitamins A and C aplenty from the squash, fiber, protein, calcium and a slew of nutrients from the whole grains (check out this chart comparing freekeh to other grains), and some leafy-green Vitamin K from the parsley (use as much of it as you want, the whole bunch, why not? 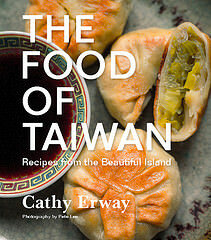 ), this dish is low-carb and well-rounded. A great complete meal. The fats are pretty minimal, from the feta and heart-healthy olive oil, and you can skimp down on portions of these if you want. Eight brownie points: Organic grains from local farms distributed by Cayuga Organics might be all the rage lately, and for good reason. They’re versatile, interesting to explore and healthy, and they’re an encouraging sign of more grains being produced in the state. Bob’s Red Mill, another line of all-natural and organic grains that I got my bulgur from, is based in Oregon, but it’s widely available and was even in my local (and none too fancy) Associated Supermarket in Crown Heights. Squashes are still around this wintery season at the Greenmarket, as are carrots, which could work nicely here as well; maybe some roasted rutabaga or turnips would be a tasty twist here instead. The feta, parsley, lemon and olive oil were not local in this version, though a really great feta can be found from Three-Corner Field Farm if you catch them at the market. Awesome post! You’ve reminded me of just how many grains I have yet to try (and I thought I was a pioneer for cooking barley this week :p). This dish looks fantastic. I am a verified butternut squash addict and also love just about anything with feta. Delicious. This was just the encouragement I needed to break out of my instant brown rice rut! This looks delish! I like the addition of freekeh…cuz I like freekeh. 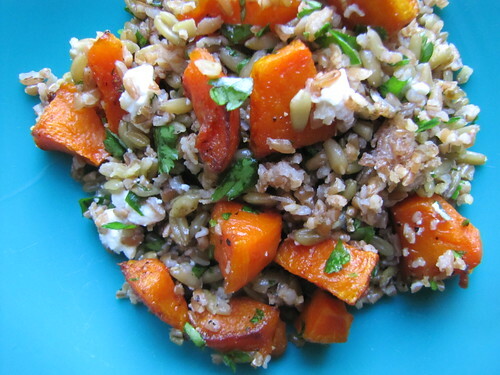 And combined with bulgur is a good idea, b/c freekeh can be heavy. I wouldn’t say freekeh is spelt, however. Spelt is some old-school Eastern Euro variety of wheat, and to my knowledge freekeh is just…plain modern wheat, whatever variety they grow in the Middle East. It’s picked green, then dried and cracked–so it’s basically bulgur, but with green wheat. Also, Syrian and Lebanese freekeh usually has a mild smoky taste because it’s dried over fire. Egypt freekeh isn’t usually smoky. I see the Syrian stuff more and more in grocery stores in my neighborhood. Thanks so much for posting this! The recipe looks wonderful, I actually had a freekeh and butternut squash risotto not too long ago and have been searching like crazy for freekeh so I could try to replicate it. I will definitely be checking out Cayuga Organics. Thanks, all! 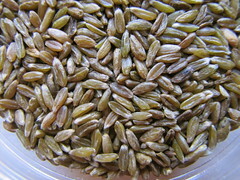 Zora: Reading into it, I became aware that freekeh is usually a different grain from spelt, or wheat, but similar, too. However, Cayuga Organics’ freekeh is the exact same grain as their own spelt, only they’ve smoked and roasted it in the classic freekeh manner, and so call it such. (Farmers told me so.) So, use freekeh or spelt or whatever you choose, and I hope to get my hands on some of the stuff you’re talking about soon, too! I’m so thrilled that you’ve discovered delicious, smokey frikkeh. Do you know my WHOLE GRAINS FOR BUSY PEOPLE and WHOLE GRAINS EVERY DAY, EVERY WAY (which won the James Beard Award in the “healthy focus” category)? I’ve written a review of your new book for HuffPo Green pages. Congratulations on a terrific read! I’m on a grain bent too, with bulgur and farro .. I grew up eating both and cannot get enough of them while it’s cold out and I feel like i have to have something to fill me up! BTW, I really enjoy your blog … I’ve added it to my brand new blogroll too. Thanks for giving me something fun and useful to read every week. I searched through two cities in Oregon USA (Eugene and Portland) and was not able to find freekeh. So, I used barley instead. Bulgar was easy to find. I love quinoa, so I will be adding that too for my party. I would love to try freekeh some day. It doesn’t appear to be available on-line yet in the store linked to in the article above. I used fat-free feta. I have nothing against full-fat cheese. It’s just that the fat-free version was easily accessible and my party is going to be a chocolate-tasting of over 20 quality chocolates. People are going to get enough fat from that. I used curry powder instead of cayenne pepper. It made my house smell wonderful! I just made this and I love it! This will be great to pack for lunch tomorrow, too. I love to take all my nutrients from natural source/food as much as possible. So this is great recipe for me. P.S. I’ve been reading your book and enjoying so much!